New Delhi, Mar 26 (PTI) Teeth, zipper, mint and add sandpaper to the list now: the desperation to extract reverse swing in unfavourable conditions has driven international teams to find bizarre ways to tamper the ball. Cameron Bancroft hiding a yellow strip of sandpaper in his pants easily fits into one of the many bizarre ball-tampering tactics but perhaps more sillier in execution when hawks like 'Oscar-The Cameraman' are in operation. The phenomenon of ball-tampering has been around for decades in the gentleman's game and the infamous incident in the third Test between Australia and South Africa has only put spotlight back into the 'illegal yet almost unavoidable' tactic. In the mid-70's, one of the earliest allegations of ball tampering was levelled against England seamer John Lever, whom the Indian captain Bishan Singh Bedi had accused of using vaseline to aid pronounced swing during MCC's tour of India in 1976. Bedi was then targetted by the British media for trying to malign an England player. The rule allows the use of sweat and saliva to shine the ball but it becomes an offence the moment you do that with an 'artificial substance', leaving a grey area in between. The fielding sides has been found working on the ball for decades but it was not until 2000 when Waqar Younis became the first cricketer to be suspended for ball-tampering. However during Pakistan's tour of 1992, the two W's Wasim and Waqar were accused of getting excessive reverse swing with allegation that they used bottle opener to scruff up the seam of the Dukes ball. Repeatedly bouncing one side on the ground and scratching the seam are common ways of getting the seam scruffed up on abrasive surfaces but some players suddenly become more "creative" than required. Bottle openers, zippers of trousers, lip balm, hair gel, or in Bancroft's case, a sandpaper then come into use. Back in 1994, England captain Michael Atherton was accused of ball-tampering after cameras caught him rubbing the ball with the hidden dirt in his trousers' pocket. Atherton later claimed that he had dirt in his pocket to dry his hands but was still fined 2,000 pounds for not disclosing the substance. 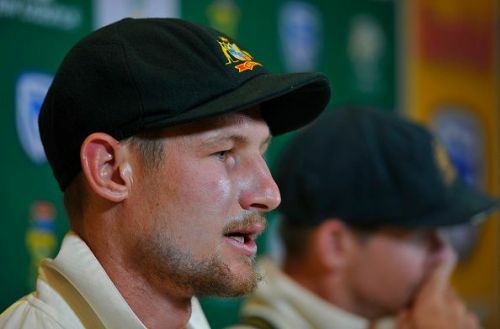 The then England skipper's case will never be proved but sometimes confession by players make the job much easier for the match referee, like it happened with under-fire Australian Steve Smith and Bancroft in the recently concluded third Test. Some choose to confess after they retire, like what former England opener Marcus Trescothick thick. The stylish batsman has revealed in his book that he used mint-induced saliva to shine the ball during the 2005 Ashes. "Murray Mints worked really well," wrote Trescothick. In 2010, former Pakistan captain Shahid Afridi found a new way to prepare the ball as he was caught on television biting the seam during a T20 International against Australia. It resulted in a two-match ban though Afridi claimed that he was only trying to smell the ball. Current South African captain Faf du Plessis has been found guilty of ball-tampering multiple times. The first time was in 2013, when cameras caught him scuffing the ball with his trouser zip during a Test against Pakistan in Dubai. Three years later against Australia, he used mint saliva on the ball and was fined his match fee. Commenting on the controversial subject, former India pacer Ashish Nehra said that there is nothing new about ball tampering. "Yes, it's an art but then stealing is also an art. Would you put a thief in jail or praise him. Reverse swing is an art but ball tampering is dishonesty. And there are ways to prepare a ball for reverse swing without tampering," said Nehra, who is one of India's finest exponents of swing bowling. "Also this is a phenomena, you will find mainly in Test cricket as in T20 and ODIs, it's difficult to reverse the white ball. In ODIs, two new white balls are used, so chances are really less. It's only in Test cricket which is played for a considerable amount of time that teams want their bowlers to try reverse swing," he added.